The Oscars are just around the corner, so now's as good a time as any to start amping yourself up by revisiting past highlights. And the show's producers, with help from 180LA, are making it easy to get a quick fix with the four new ads below, cut together by Oscar-winning editor Kirk Baxter. The first, "And the Oscar Goes to," features a parade of stars—too many to name, though movie buffs might have a fun time trying to rattle them all off—doing their best victory dances. Their exuberance is pretty moving, even if it's plenty vain, too. 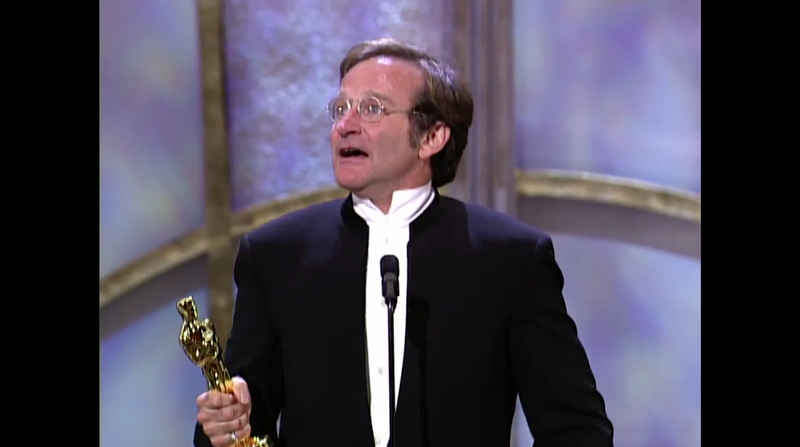 A second, "Holding Oscars," features the campaign's most poignant moment—one second of Robin Williams looking around in breathless gratitude, a genuine scene that makes the loss of such a talent sting all the more in hindsight. The third spot, a multilingual Kumbaya "Everyone Speaks Oscar," can't help but be a bit corny. (Sure, movies are a universal language, sort of, but really, where would most of us be without subtitles?) Still, the Academy deserves a nod in the Best Lie category for trying to pretend Hollywood isn't a U.S.-dominated enterprise, and implying the winners are an ethnically diverse bunch—when in fact they're mostly white. The fourth ad, a Valentine's spot featuring the likes of Matthew McConaughey and Tom Hanks kissing their wives at the show, is cute enough, set to the fairly obscure but anachronistically charming sounds of "Am I in Love" from 1952's Son of Paleface, performed by Bob Hope and Jane Russell. For good measure, 180LA also commissioned a series of 15 posters featuring the Oscar statue alongside various artists interpretations of imagination (a popular theme in ads because it's hard to hate). The results feature a number of nods to the award show's roots in the Art Deco era, but the standouts are really the weirder takes—like Hattie Stewart's leering, winking cartoon hearts, and Blastto's surrealist eyeball sculpture. Because if those aren't apt metaphors for America's unhealthy obsession with celebrity, what is?